Today, I continue our 4 part series on heart rate training. In the last podcast, I introduced you to the basics of heart rate training and the pros and cons of using the method. 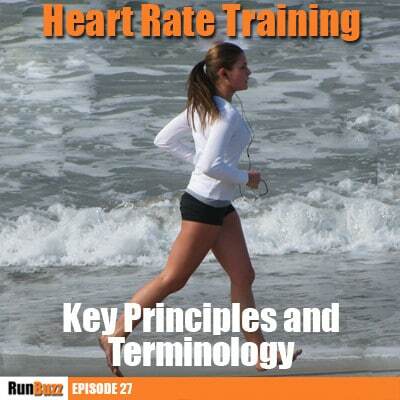 Today, we’ll delve a little deeper into the concept by covering heart rate terminology and key training principles. If you have not yet listened to episode 26 or read the article, I highly recommend that you go back and do so now. It properly kicks off the topic and sets up the discussion we’ll have today. As I mentioned in the last episode, the fundamental workings of the human body and its ability to adapt to stress mechanisms (like running) are greatly influenced by intensity. While many other factors play into how well your body adapts to training, intensity is something we can actually control ourselves. However, based on what I frequently see (and often do myself! ), intensity is also one thing us runners tend to screw up. So, you may be asking, what exactly is intensity? Is it really something that you can measure? Is intensity something you can perceive? And, if you can perceive it, how do you know if that perception is accurate? At its core, intensity simply comes down to how hard or easy your body is working. Certain physiological markers, like heart rate, rate of breathing, and power output, can help you identify and measure intensity. Traditionally, heart rate has been the mechanism that we turn to to measure our intensity level when running. On any given run, runners can be training at various intensities. They can be pushing hard, even reaching peak intensity if they’re in a full out sprint. Or they can be puttering along slowly at a low intensity. It’s likely that most of us usually fall somewhere in between. If it helps, you can think of your pace as your speedometer and think of intensity as your RPM gauge in a car. This RPM gauge analogy is great because, as runners, we should always have a mental bookmark of what our intensity level is at any given point in a run. We should also be varying our intensity when we train. There will be times where we want to conserve fuel and teach our body to do so and times where we want to test the engine out a little. This is one place where heart rate training can come in handy. While heart rate can be pretty good indicator of intensity, it certainly isn’t perfect. It’s important to keep in mind that, like most training methods, it can have its problems. For instance, your heart rate can be thrown off by several different factors, like caffeine or alcohol consumption, stress, certain medications, and even lack of sleep. The impact of these elements on your heart rate can be a problem if you’re attempting to use heart rate training for very specific purposes. For example, fatigue caused by over training can cause your resting heart rate to rise slightly higher than normal. You can detect this elevation when tracking your heart rate. While this may work great in a perfect clinical setting, in reality, there are so many other factors that can impact your heart rate that you can’t exclusively say a slightly elevated resting heart rate is truly due to over training. Or take this other example into consideration: The best time to take your resting heart rate is first thing in the morning after a good night of sleep. So, before you get out of bed, test your heart rate. Lie still and measure how many beats occur in a minute (you can do this quickly by measuring your rate over 15 seconds and multiplying the number by 4). Track this in a log over several days and you can determine what your average resting heart rate is. Now, let’s say you find your average heart rate is 54 bpm. But then, one morning, you test your resting heart rate and you get 60 beats per minute. That rise could be an indication that you have been working your body too hard. But wait – don’t let that number throw you into an over-training induced panic yet. That elevation in heart rate could also mean that you woke up a little fast, were awakened in the middle of a dream, moved more than usual to retrieve your monitor, or that you’re getting sick. So how sure are you now that that elevation in heart rate is due to overtraining? Other external factors can also change how you feel when it comes to intensity. On a hot day you might not be able to sustain the same 9:00 minute pace that, on a cooler day, was a cinch. Or maybe you had a stressful day at work, fought traffic to get home, haphazardly through dinner together for the kids, and then went out for your run, still frazzled from the events of your day. Your heart rate might be higher than normal because you are tired and stressed. It’s instances like these why I say that, in practice, perfectly tracking your resting heart rate isn’t as clear-cut as you might think. As if tracking your intensity didn’t seem ambiguous enough, it turns out that your levels of intensity change as you become more or less in shape. But don’t let that scare you away – it can actually be a good thing. A very good thing. Whenever we properly train and combine it with proper recovery , we get progress. As you get more fit, your body adjusts to the stress of training and is able to do more. What feels hard one week, will seem easier the next. And, not only will it feel easier, but you may go faster or further as well. This concept ties into a fundamental training principle that says, when you put appropriate stress on your body, say through running or exercise, and then alternate that stress with periods of recovery, your body will adapt to the stress and get stronger. As you run and get into better shape, your body starts to become more efficient. As a result, your lungs start to adapt and become more efficient at oxygenating your blood. Your heart gets stronger and starts pushing out more blood with each and every heartbeat. Your body starts getting better at utilizing fuel stores so that it can continue to fuel you when you run. These are just some of the reasons why running gets easier after you have been doing it for a while. Now, when it comes to intensity, we often see – actually, feel – an increase in intensity from stress when we do things like speed up our pace, run up a hill, or run in extreme weather. But remember – faster pace does not always mean higher intensity. Usually it does, but not always. For example, if you push yourself faster or harder than you’re used to, congrats – you just experienced a rise in intensity. However, a 9:00 minute pace today might not be as intense as it was when you first started running. As your body adapts to stress, what once seemed difficult will eventually seem easy (or less intense). Also, as we discussed before, external factors like weather and fatigue can affect your intensity. So, that same 9:00 minute pace ran in ample balmy weather will fell much more intense if ran in the Sahara desert or a frozen tundra. The best part about heart rate training is that it can help balance out some of those outside factors that affect intensity – it helps you know when to slow down or speed up to stay in the proper training zone. Despite what you may think, running faster is not always better. In fact, we should spend about 80% or so of our running time on the lower end of our intensity gauge and 20% or so at the higher end. When it comes to training, different things start to happen at different levels of intensity. It’s here where intensity really plays an important role. You’ve likely heard the piece of running advice that says you should run long runs slower than every day training runs. Well, why is that? It’s because, when you run slower, you tend to be in more of an aerobic state (more on this in a moment). Training in this state helps benefit your body’s ability to build endurance, utilize fat stores, and conserve energy. So, unless you are dead or, like me, a cubicle dweller by day, you are a living, breathing human being. It’s also probably no surprise that, when you breathe, you take in oxygen and exhale carbon dioxide. Well, when we breathe, the lungs help pass oxygen into your blood vessels. This oxygen-rich blood is then sent to your heart where it gets pumped out to all parts of your body. The oxygen in the blood then makes its way to your muscle cells where the oxygen mixes with other cellular and biological processes to turn stored fuel into energy and, ultimately, create muscular action. In other words, your breathing helps fire off a series of muscular contractions and, bingo, you’re able to run. This, of course, is an overly simplistic view of what happens, but, hopefully, you get the idea. If we run hard enough to where we’re out of breath then, chances are, that shortness of breath is a good indication that you’re primarily running in an anaerobic state. In other words, you’re running so hard that your respiratory and cardiovascular systems can’t keep up with your body’s oxygen needs. As a result of this higher intensity running, you soon go into a state of oxygen debt. You can’t catch up to this oxygen debt unless you slow down your pace. On the other hand, if you’re comfortably running along and you feel you can continue your pace for a bit longer, that’s a good sign that you’re likely running in an aerobic state. In this case, your respiratory and cardiovascular systems are able to continue delivering the oxygen your body needs to efficiently convert stored fuel into energy. Now, to make things more complex, you aren’t always entirely in one state or the other. Often you’re getting enough oxygen in some places of your body but not enough in others. There is no absolute. However, your body will always try to go into a steady state, or a state of homeostasis. This is just a fancy word for things being in some form of equilibrium. Now, as we’ve been going along I’ve snuck in the word fuel here and there. What I am referring to, in these cases, is stored energy like fat or carbohydrates, also sometimes referred to as muscle or liver glycogen. Protein, in extreme cases, can also be used as a fuel source. However, this usually occurs after the body has exhausted most of everything else. I don’t want to go into the weeds here with fueling because that would turn into a whole other series – but think of fuel as gas in a car. If you go slow, you tend to get better gas mileage. If you go fast, your gas mileage, well, isn’t so great. This is why you can’t sprint a marathon. How you access the fuel comes down to intensity and time. Some fuels are accessible very fast, like carbohydrates. Others fuel sources take time to access, like body fat. The good news is that, technically, you have enough body fat to last you much longer than you would be willing to run. As a living, breathing human being, your body is busy carrying around that precious oxygen we just read about, as well as a little bit of fuel in the form of sugars, to your muscle cells. These sugars are called glucose (or glycogen in their stored form) and come in various forms, from simple sugars to complex sugars. However, most of them are in the form of carbohydrates. Your cells, when they need energy, can either take energy from the glycogen available or used stored fat. This is where you’ll often hear the term burning fat. Fat is a great source of energy. Your body pulls energy from the source it can most appropriately get to when it needs to. It’s not one over the other. So, where your body takes it fuel from is key. When your body has enough time and oxygen, fat metabolism can occur. This process converts body fat into a fuel source. However, the problem with this method is that converting stored fat into energy takes more time than using other sources, like stored muscle and liver glycogen which are already mostly broken down. Well, sometimes we ain’t got that time – we’ve got a bear chasing us down or we’re in a head to head foot race to get that WI-FI smart toaster on sale at Target on Black Friday. Well, in that case, there is a better choice: Sleep in on Black Friday! In all seriousness though, it’s that glycogen I was talking about. You see, glycogen can convert into actionable energy very quickly and does not require the presence of oxygen. So, when you need energy and need it fast, your body reaches into its glycogen stores, not its fat stores. What’s fascinating to me about the human body is that it can overcome problems. You see, you can only consume, absorb, and deliver oxygen at a certain rate. You can’t force your body to absorb an unlimited amount of oxygen before it’s reached its max capacity. VO2Max is this maximum amount of oxygen that your body can intake and absorb. But there are times in our life, like when we are being chased by bears, that we need to run fast, even if only for a short time, like to find the nearest tree (Yes, I’m aware that bears can climb trees, but just go with me on this). So, in this case, our body goes after that immediate source of energy. As I mentioned before, as runners, we don’t just use one fuel source. We turn to whatever source is available when our body needs it. When we run slow, we have more oxygen available. Then, since we have the time, it’s more effective to primarily use fat as a fuel source. On the other hand, when we run fast or at a higher intensity, it’s more conducive to primarily use glycogen as a fuel source. I say primarily because, even when running slow, you are still using some glycogen. The only problem is there’s a limited supply of it. Your body is like the fuel tank in your car – it can only hold so much. So we either need to conserve energy by running at a lower intensity or we need to properly replace that energy when running at a higher intensity. The best way to replace energy is by consuming carbohydrates when we run past what our muscles and liver have the capability to store. For most trained runners, this is around the 90 minute to 2 hour mark. This is why endurance runners love sport drinks and gels. It helps them keep their fuel tank full for as long as they can. Eventually though, we outrun our body’s ability to replenish its fuel source. It’s here where the dreaded “bonk” or “hitting the wall” occurs. . But it turns out that we can maximize holding onto our energy source by training our body to store as much fuel as possible for as long as it can. Now, how do we accomplish this, you ask? If we train at the right level of intensity, we can teach our body not only to store more glycogen but to hold on to it for as long as possible. If we train at the right level of intensity, we can teach our body to be more efficient at converting fat into energy. At this point, if you have the concept down, hopefully you can see the correlation between intensity and energy usage, and how heart rate training can be of use. To clarify – Heart rate training gives you the bio feedback necessary to monitor your intensity so that you are training at the right level for the purpose of your workout. As we’ve already established, training in the correct heart rate zone is critical, especially when training at higher intensities. If we train in the correct zone, we can not only convert lactate back into fuel but also increase the rate at which lactate is removed from our blood and muscles. Whoa – hold on there! I just introduced a new term: lactate. This is an important concept and one where a lot of confusion can arise, so pay close attention as we go along. My explanation will be an over simplification, but let’s go ahead visualize the idea. Mentally draw out a line in front of you from left to right. Now, on the left side of the line, write the word “aerobic”. On the right side of the line, write the word “anaerobic”. This gives you two different spectrums. Somewhere along the line between the spectrums is a crossover point where you go from being in a primarily aerobic state to a primarily anaerobic state. Notice I said primarily again and not exact. Let’s call this crossover point the lactate threshold. This is a key principle, and one we will get to in more detail in a minute. I previously discussed the switch from aerobic to non-aerobic running. Lactate is a byproduct of something called anaerobic glycolysis, which occurs when glycogen is converted into fuel. The faster you burn through it, the more lactic acid is generated. Now, I’m not going to go into the entire process of how this happens. If you really want to know, look up how ATP is converted into ADP and how, eventually, acidosis is created. You really just need to keep in mind that, when you train, a certain amount of lactic acid is created. The higher the intensity you run at, the faster it’s created. As a result, lactate increases to help absorb and clear away the lactic acid. When lactate accumulates faster than it can be removed, you have hit your lactate threshold. Now, lactate is cool. Once it was thought to be an evil substance, but it really isn’t. Some lactate can be turned back into a fuel because it picks up some extra ions and re-bonds into a form of usable energy. The problem is, not all of the lactate gets used and what’s left is flushed out as waste. If you really want to see a video on how this all occurs at a cellular level, I recommend heading over to Khans Academy and checking out their free videos, especially the cellular respiration video. This wraps up the “mad scientist” talk and the physiology lessons that we needed to cover to take heart rate training from theory to practice. Lactate threshold is an important concept because, as you will find, it’s something that can be trained. The higher up you move your lactate threshold, the more you can conserve your body’s ability to hold onto glycogen longer and the higher tolerance you will have with high intensity running. It’s also a key metric that can help you set up your heart rate training zones. In the next podcast, episode 28, I’ll help you estimate your lactate threshold, along with your max heart rate and resting heart rate. We’ll then set up training zones based on these numbers. If I’ve done my job properly, hopefully you have a better understanding of why intensity matters and how you can target certain outcomes or benefits in your running, whether it be measured by heart rate or by pace or effort.